I’ve been following the latest TED shenanigan since Day One. It gets more interesting day by day. See my post here and here. After almost a week since TED “censored” Rupert Sheldrake and Graham Hancock’s TEDx talks, the organizers of the TEDxWhitechapel finally responded to its parent organization with a very eloquent Open Letter. It’s posted on the TEDxWhitechapel Facebook page but I’m also posting it here for everyone to see. Read below. 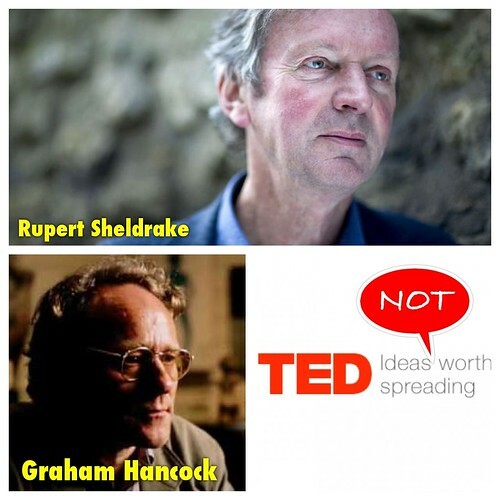 We, the TEDxWhitechapel team – the initiators and co-curators of the event – have deeply reflected on your actions to remove the talks of two of our speakers Rupert Sheldrake and Graham’s Hancock from the official TEDx Youtube channel. We wish to clearly and openly express our views on the matter with the intention of constructively contributing to the discussion as well as to highlight potential pathways for moving forward which are mutually beneficial to all parties involved; our speakers, the TED corporation, and the TED community. We want to begin by sharing what TED means to us. We have been genuinely transformed through many of the inspiring TEDTalks; they have profoundly challenged our perceptions of and assumptions about the world, opening us up to new perspectives outside of the established mainstream thinking. Moreover, we really believe TED to be an ingenious medium to spread ideas across the globe. As such, TED represents the free and open flow and exchange of ideas globally, enriching and empowering an increasingly connected global community. And it is with this passion that we decided to host a TEDx event with the theme “Visions for Transition: Challenging Existing Paradigms and Redefining Values (for a more beautiful world)’. We believe that in order to deal with the diverse and complex crises converging on our planet, we need to challenge the dominant thought paradigms and radically reassess the values which govern our world. In line with Einsteins wisdom “problems cannot be solved with the same level of thinking that created them” we saw TED as a truly special platform. You can understand therefore, how shocked and saddened we were when we were alerted to the news that you had decided to remove Graham and Rupert’s talk from the TEDx Youtube channel and furthermore the disrespectful way in which they were treated publicly on the TED blog where you moved them. We would like to offer our insights to you, as to why we chose to invite these speakers. We were guided by the advice that TED gives for identifying great speakers, which was as follows. To build a powerful speaker program, seek out extraordinary voices in your local community who have a unique story or an unusual perspective — and who can convey it in a dynamic way. Naturally, we don’t expect TED to agree with the content of the talks, nor are we suggesting that they represent the ‘truth’. We think science offers us a kind of lens with which to view an unfathomably complex world. These speakers challenge the mainstream scientifically accepted viewpoints and this is exactly where their value lies. TED is a platform where these different points of view can be shared, debated and challenged so that we can collectively keep evolving and developing in our understanding. In fact, in light of this situation, we are now even stronger in our conviction that these are valuable ideas that need to be discussed and debated widely. The massive response from the TED community and the conversations which this has sparked, tells us that there is much interest in these ideas and therefore that they are highly valuable to the science debate. Indeed, if they were so totally radical and ridiculous as you suggest they are, it leads us to wonder why they have they been worthy of so much attention? Both talks have simultaneously been supported and challenged, which for us reflects a model of how the progression of scientific understanding develops and flows. Therefore, we do not support your actions to put the talks on separate blogs where they are hidden from the TED community, cannot be shared, and where the conversation is limited. We also oppose the lack of integrity with which they have been treated. In particular, It is obvious that the content of many of the other existing TEDtalks would not hold up to scrutiny were the same criteria applied to them. Furthermore, we hope that you would grant your community the respect to use their own faculties of discretion and reasoning with regard to the ideas and content of the talks. As such, we request and urge you to re-upload the talks not only to the TEDx youtube channel, but also on the official TED.com site, including links to the discussions taking place on the TED blog. We also see this as a vital opportunity for TED to enhance their reputation as a forum for the free flow and sharing of ideas and open debate and an opportunity to win back the trust which may have been lost. We think the controversy over these talks is a wonderful opportunity for TED to clarify and strengthen it’s commitment to free thought, especially in the face of pressure from highly committed ideological interests from the blogosphere. Otherwise, we fear that TED will take a lot of criticism for censorship. Several of the other speakers, even if they don’t fully agree with Sheldrake’s and Hancock’s positions, are quite upset that their videos were removed. At our urging, they have been holding back from going public, waiting to see how this plays out. It would be a shame if this ends up causing negative publicity. We hope that you will consider this as an opportunity to become a resilient and remarkable organisation: one that has the capacity to be self-reflective, self-critical, adapt to change, evolve and grow with its communities and the challenges it faces. Most of all, that you can stay true to your values as a democratic and open platform for ideas worth spreading. It seems to us that enhancing Radical Openness by accepting our invitation to reinstate the talks publicly online, is an outcome that can benefit all parties involved. We appreciate your time to consider our message. As for me, I’ve jumped in the TED Conversation threads expressing my own views on this TED fiasco. (See all my posts on TED Conversations.) Here’s my bottom line opinion. It’s not as eloquent and politically correct as the response from TEDxWhitechapel. But it’s essentially expressing the same thing. – you made a mistake of (soft) censoring Rupert Sheldrake and Graham Hancock’s TEDx talks. please restore those videos to their original distribution channels. – you owe Sheldrake and Hancock a sincere apology. – moving forward, please don’t be bullied by a couple of ideological atheists/skeptic bloggers. they’re not worth it. they’ve done more damage to your brand than the speakers you have censored in the past. – Sheldrake and Hancock have issued a public challenge to debate anyone from the TED Science Board and/or the TED Brain Trust. TED will look *really* bad if you don’t take this challenge. – no more tricks. no more excuses. no more insulting our collective intelligence. we saw through this shenanigan since day one. thank you very much. i’m hoping that you will do the right thing. First, they pulled out the Sheldrake and Hancock’s TEDx videos from the official distribution channel, framed the videos on the TED Blog with baseless accusations, and in the process, wrote a potentially libelous information against two well-known speakers who donated their time at a TEDx event. My second big issue with TED is that, it is apparent to me that a couple of ideological atheists/skeptic bloggers (let’s call them Jerry Coyne and PZ Myers) seem to have this big influence on TED. It’s fine if they have something substantial to back up their critiques of Sheldrake and Hancock, but so far, I haven’t seen anything which hasn’t been adequately addressed by both Sheldrake and Hancock on their responses. In fact, Sheldrake and Hancock even issued a debate challenge to TED’s Science Board and Brain Trust. No takers so far. I wonder if Jerry Coyne and/or PZ Myers are man enough to accept the challenge. I hope they do. If they really want to expose Sheldrake as a “pseudoscientist” then what better way to do it than in the arena of public debate? But PZ Myers and Jerry Coyne are probably too busy to engage in a formal debate right now. Or maybe they just want to move on. They have done their intellectual drive-by shootings already. Thanks to them, TED is in hot water right now. Incidentally, Jerry Coyne has another target on his sights. He’s now ranting about the Woo Woo speakers on TEDx West Hollywood. He’s on a mission to rid the world of pseudoscience. God bless his heart. awesome. Sheldake is Correct and Credible and combination that the high priests of Scientism can’t stand. We will support you guys. Eric Dollard is the Nikola Tesla of our time and his work makes all this an engineer able reality. Let’s support each other. I can see no validity or excuse to remove or suppress anyone of rhe TED talks that comes out. All the ones I have watched are presented well and allow the viewer to make his or her own opinion on the mater. Furthermore to ones making the accusations of pseudoscience why not debate or respond to which ever speaker they find themselves not in agreement with? That is the rational choice. Censorship and or suppression only look suspect for something purposely esoteric. How “lovely” to be attacked (www.TEDxWestHollywood.com)in a milieu where such eloquent defenses already have been made. The purpose of our program is much like White Chappel’s. And what great good could come out of all this as Craig Weiler wrote about in his fabulous piece: http://weilerpsiblog.wordpress.com/2013/03/23/the-real-meaning-behind-the-ted-controversy/#like-1717. We should have a special place for posting TEDTalks that were dealing in these areas that are troubling TED now, that were made before the thought police went on duty. good to know that one of Sheldrake’s arch-nemesis was not behind it. if this second-hand information is true then Dennett, me, and most of the people who cried foul at TED are on the same boat. This was posted by c4chaos on Friday, March 22nd, 2013 at 11:02 pm. Bookmark the permalink.